Greenwich Paige Finneran (2) scores on a drive as Cheshire's Mikayla Crowley (3) andAnnie Acquavita (9) give chase in the first half Saturday at Greenwich High School. 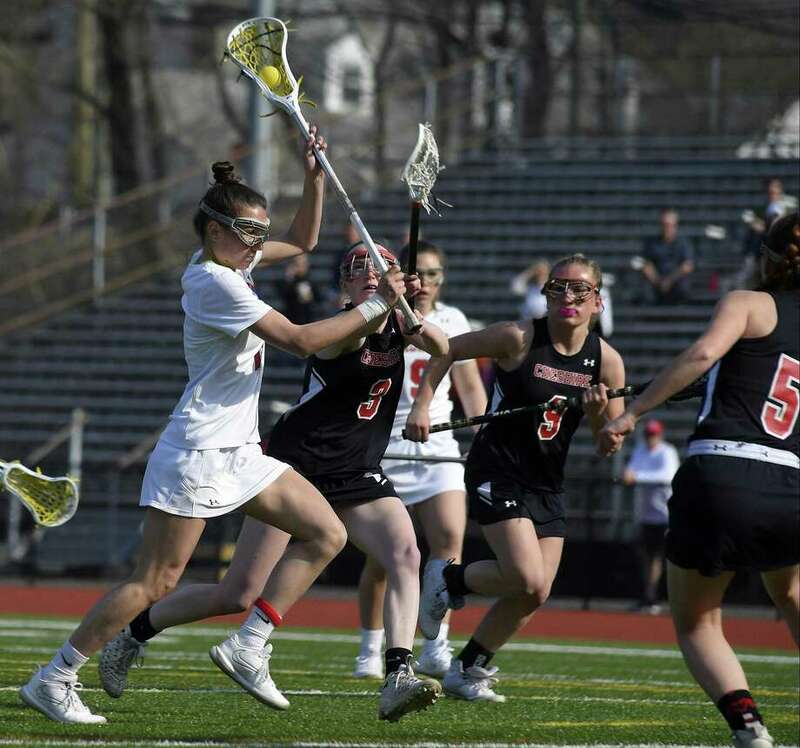 GREENWICH — Last season’s meeting between the Greenwich and Cheshire girls lacrosse teams saw the Cardinals edge the Rams by one goal in an overtime thriller. Saturday’s game didn’t go to overtime, but it sure was exciting, as once again, one goal separated the two squads. And again, it was the Cardinals that pulled out a close win. Facing a two-goal deficit, Greenwich scored four unanswered goals to register a well-earned 11-10 victory over Cheshire in a non-conference game at Cardinal Stadium. With their fifth straight win, Greenwich raised its mark to 5-1. Senior tri-captain Maggie O’Gorman and junior Paige Finneran each recorded hat tricks for the Cardinals, who overcame a 9-7 second-half deficit. Junior Annie Eddy tallied four goals and one assist for the Rams, who entered halftime in a 5-5 deadlock. Senior attack Mia Pulisciano had three goals for Cheshire, which also suffered an 11-10 loss to Greenwich last season. Junior attack Grace Fahey tallied twice, as did senior midfielder Genevieve DeWinter for Greenwich, which also received one clutch goal by junior Jennifer Kelly. Sloane Loveless, a junior goalie, turned in a strong effort, making six saves. Behind 9-7, Finneran brought the home team to within one goal when she scored shortly after the draw with 15:05 left to play in the second half. DeWinter put free position shot past Rams sophomore goalie Sophie Kurtz, tying the score at 9-9 with just over 10 minutes remaining. Receiving a pass from Leah Caputo, Kelly show low and scored, giving GHS an 11-9 edge at the 8:45 mark. Cheshire closed to within 11-10 when junior Mikayla Crowley converted a shot with 3:55 left. But Greenwich stayed solid defensively and in the final minute when it had possession executed an effective stall. Mautner scored the game’s first goal 4:30 into the first half, then Cheshire tallied the next two goals, with Eddy and Pulisciano making shots, making it 2-1. After O’Gorman scored off a Fahey pass, Cheshire knotted the score at 3-3 on Puliciano’s tally at the 9:50 mark of the opening half. In the second half, Cheshire had leads of 7-5 and 9-7, but the Cards came back each time. Goals from Fahey and O’Gorman made it a 7-7 game with 18:35 remaining. Gaghan liked the leadership she saw from O’Gorman, DeWinter and Sailor Jiranek — her senior captains. Kurtz made six saves in goal for the Rams (4-1). “We knew we had to slow the game down, because we weren’t going to win a shootout with these guys and I thought we did a good job of that,” Warburton said. O’Gorman and Finneran each tallied twice and Loveless was stellar in goal for GHS. The defenders also stood strong throughout for the Cards.